You know it is really starting to become winter here when the farmers’ markets become whittled versions of their robust summer selves–unusually warm weather be damned. Right now root vegetables are king, with the occasional herb trying to make its voice heard among the piles of potatoes on the market stand. This dish takes advantage of the few ingredients in season at the moment, while bringing a little color to increasingly shorter (and darker) days. This sweet potato falafel with watermelon radish sauce is one of my favorite dishes right now. I love contrasting textures and this recipe has it all: crunchy peppercorns, crisp radish, cool yogurt and soft falafel. The addition of the potato lends just enough sweetness to this dish, balancing out the more spicy elements (yes, I’m kind of a wimp when it comes to spice, at least compared to my scotch-bonnet-guzzling brother). Served warm, I think of this as my ultimate winter comfort food, it is both comforting to eat and good for you– the falafel and sauce are low in calories, high in protein and full of essential vitamins. An added bonus? While these guys look super impressive they are actually really easy to make–whip up a batch on Sunday and you’ll be set for lunch for the next few days (the falafel keep in the fridge remarkably well). For the Sweet Potato Falafel: Stab the sweet potatoes with a fork (no really, get that stress out!). Microwave the sweet potatoes until soft all the way through, about 15 minutes. Meanwhile, combine the remaining ingredients in a medium mixing bowl. Scoop out the insides of the sweet potato, add to the mixture and mash with a fork until fully combined. Place the falafel mixture in the freezer for 20-30 minutes. Preheat the oven to 400 degrees. Coat a baking sheet with olive oil. Using your hands scoop out a ball of the mixture, and form it into the shape of a football (also known as a quenelle), about 2 1/2 inches long and 1 inch thick and place on the baking sheet. Repeat, until you have used up all of the mixture. Sprinkle with sesame seeds and cook until golden, about 15 minutes. Makes about 9 falafel. 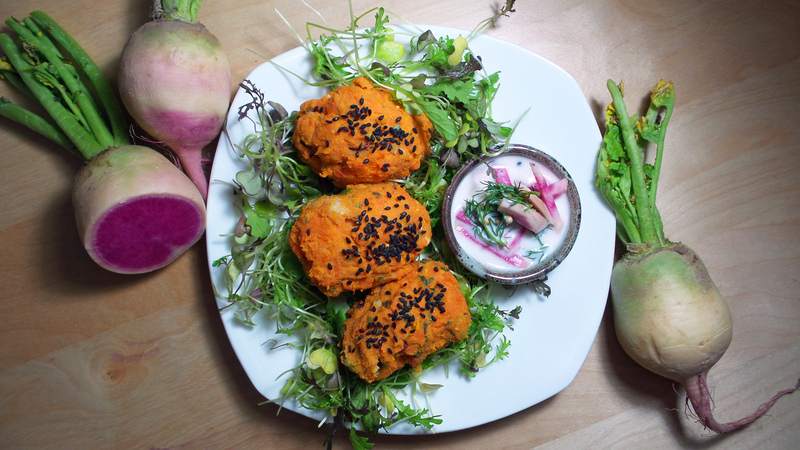 Watermelon Radish Sauce: Combine all of the ingredients, spoon over the falafel and enjoy! This entry was posted in Mains and tagged falafel, gluten-free, soy-free, sweet potato, vegan, watermelon radish. Bookmark the permalink.